It’s nearing the end of the year again, which can only mean one thing for sure – everyone will be feasting on lots of indulgent food! Let the pigging out begin. Every year, I make it a point to host elaborate and utterly gluttonous dinner parties for my friends and I, to celebrate getting through yet another tough year of life and get ourselves in the relaxed, holiday mood. Cooking food from the heart is one of the best and sincerest way to make someone happy. No one can be upset at you when you make them a meal of their dreams. This festive season, one key ingredient I’ll be including in my dishes is my favorite Perfect Italiano cheese! 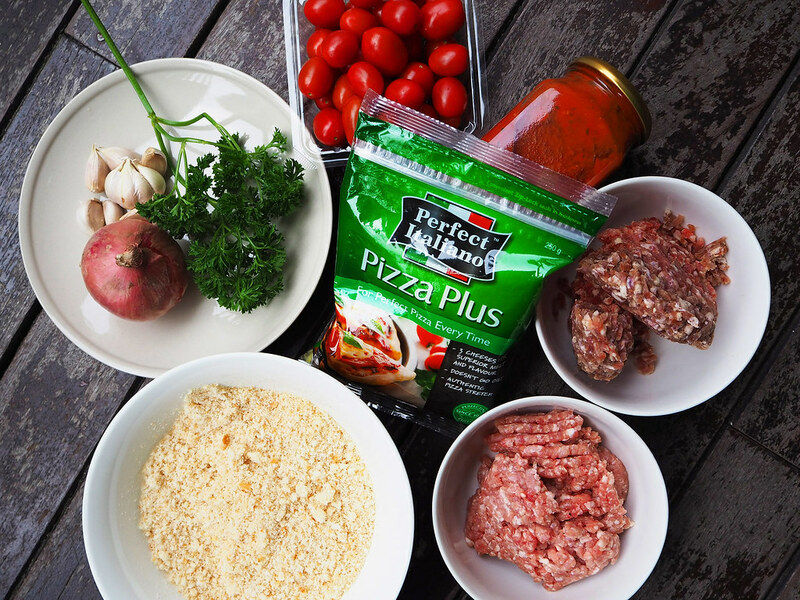 Perfect Italiano is a cooking cheese brand that adds simple Italian flair to everyday family meals. It is fuss-free easy to use, to prevent homemade meals from being difficult, complex and time-consuming. The difference between a normal chef and a great chef is careful execution and a wild imagination, and with that said, I like putting cheese on as many food dishes as I can think of! I’ve chosen to use Pizza Plus in today’s post because I adore how versatile this cheese is – it’s full bodied, yet light and textured to use in almost any dish that requires a topping of cheese. You know what’s a dish I like eating but can hardly find good versions of when dining out? 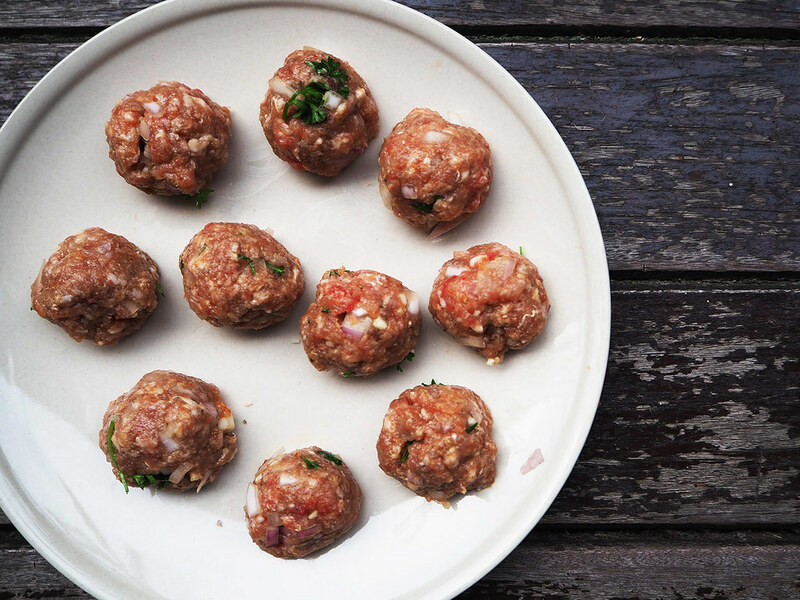 Pure, simple meatballs with moist, flavorful meat. Too many versions are too dry, tasting more like cardboad balls than meatballs. 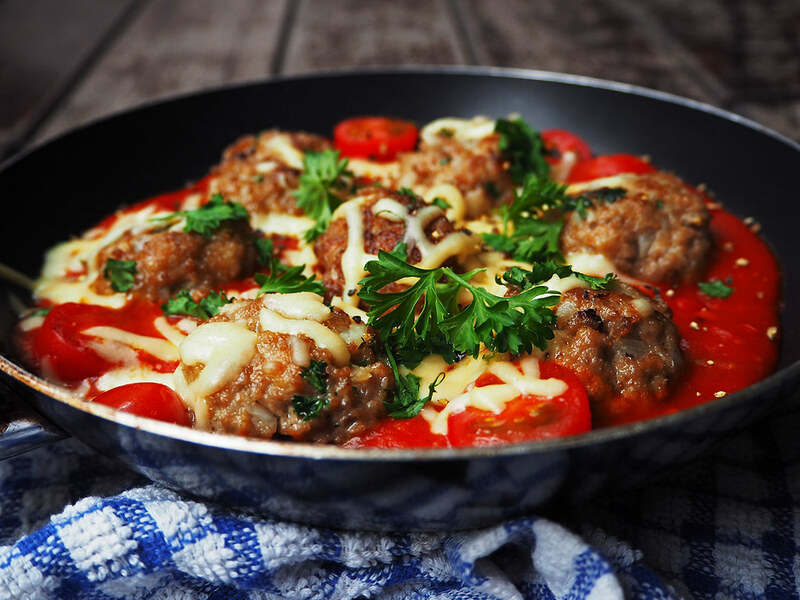 That’s why I’m going to share with you my own Meatballs in Tomato Sauce recipe, that your guests will praise you for at your next dinner party! 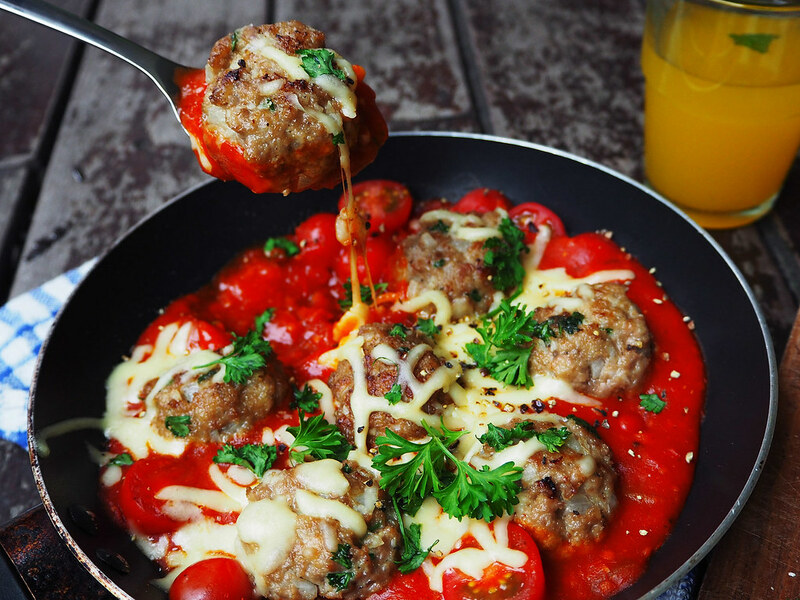 What you’re looking at is deliciously moist meatballs with a simple but comforting flavor that is elevated by the tangy tomato sauce and stretchy cheese! Don’t the bright red and green colors remind you that Christmas is creeping up on us already? 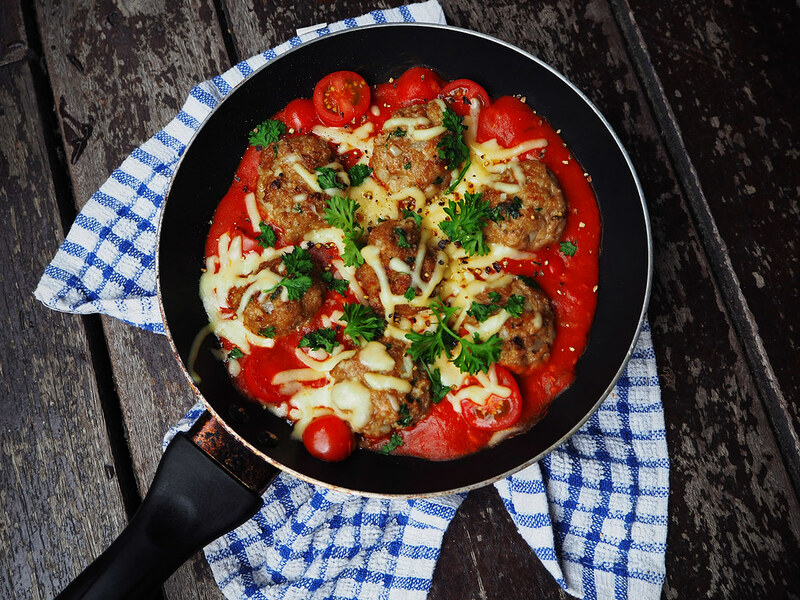 You’d want to make sure your meatballs are not too salty, because the tomato sauce and cheese contains additional salt that will contribute to the overall saltiness. 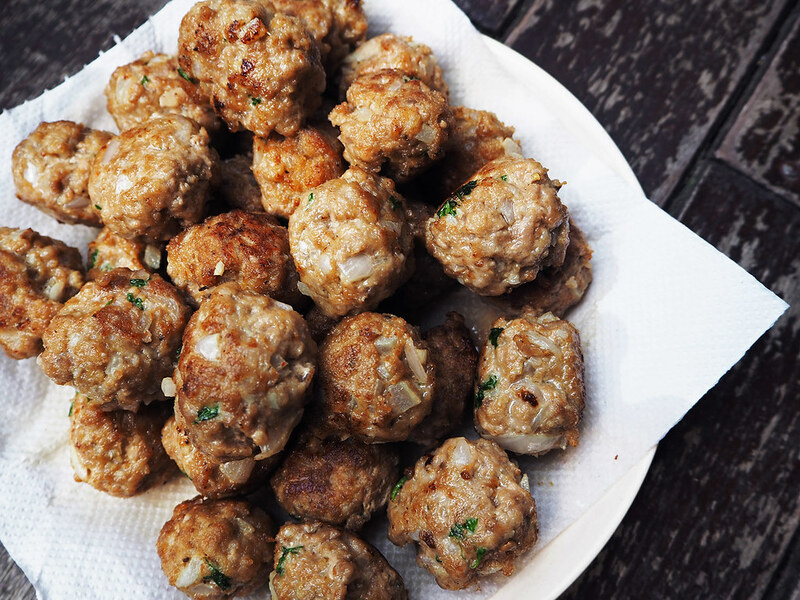 You can also substitute the minced pork for minced chicken if preferred. Just look at that tantalizing cheese calling out for help! It needs you to put it in your mouth. 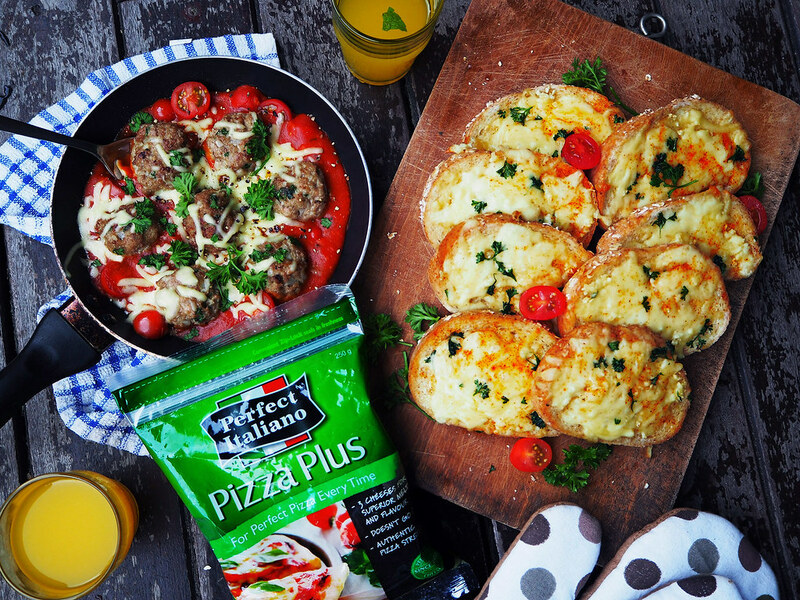 Perfect Italiano Pizza Plus is made up of three cheeses – Mozzarella, for lending that stretchy bite, and Parmesan and Cheddar for a fuller flavor. I suppose you could go the extra mile by making your own tomato sauce.This will be a popular choice with people of all ages at your dinner, especially kids who seek out tomato based dishes, and the men who enjoy red meat! 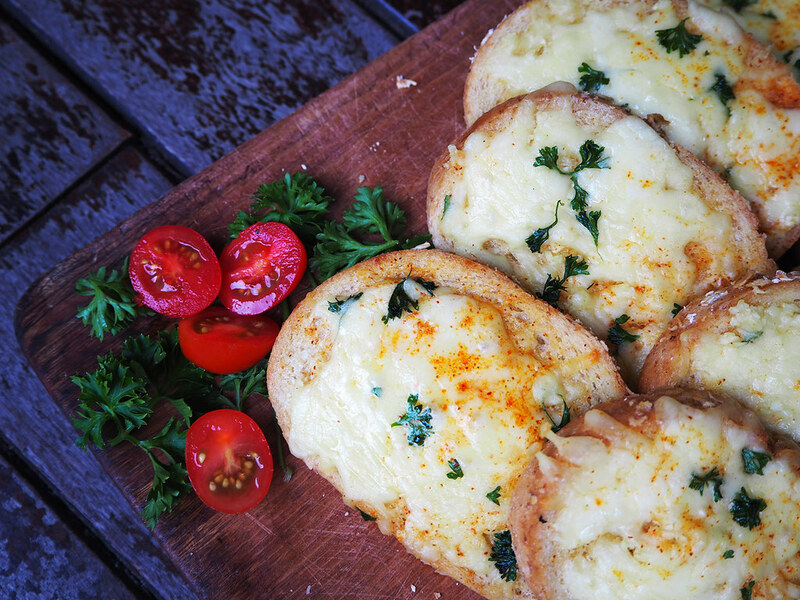 Crisp around the edges, soft, buttery and cheesy in the center – nothing but garlic bread perfection!! 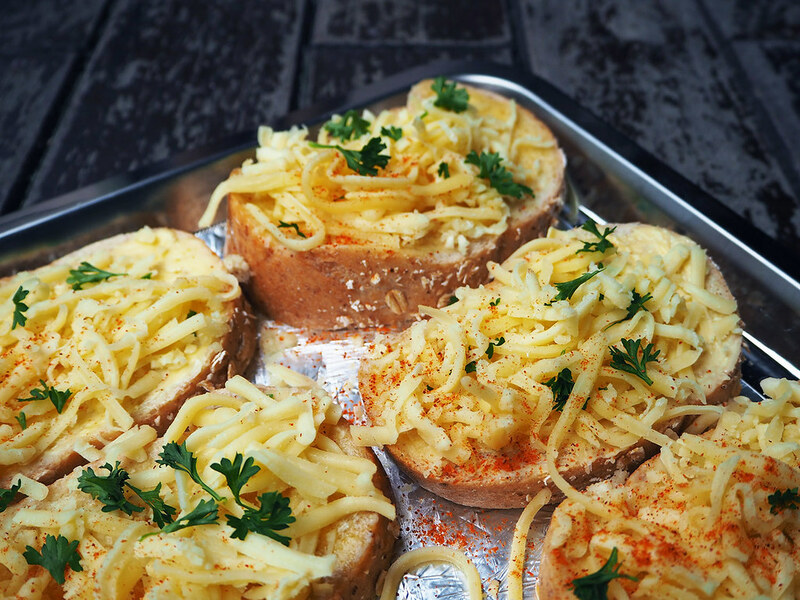 Don’t be a miser when buttering your bread – despite the copious amount of butter looking like it’s going to give you a heart attack, it’s actually what awesome garlic bread is made of. 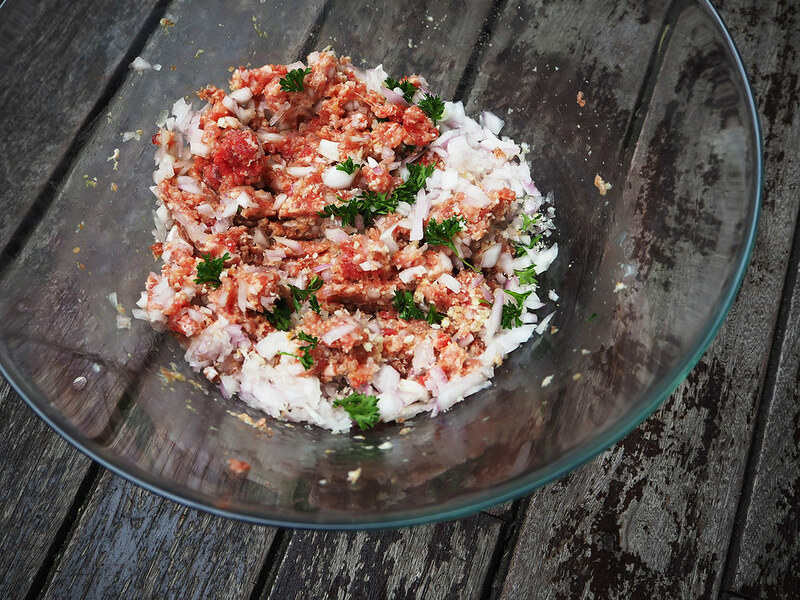 You’ll want to use freshly minced garlic instead of the dried stuff, because the flavor will be so much better. You’ll probably also want to brush your teeth really thoroughly after this meal before you talk to anyone up close. At least you’ll know you’re safe from vampires for the night. These two dishes are a match made in heaven. 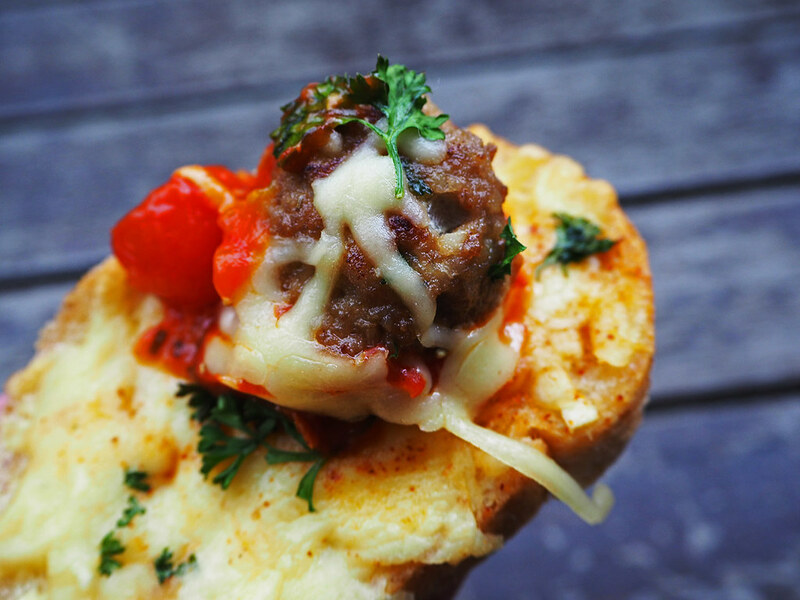 One bite will have you singing “Hallelujah” in your head! 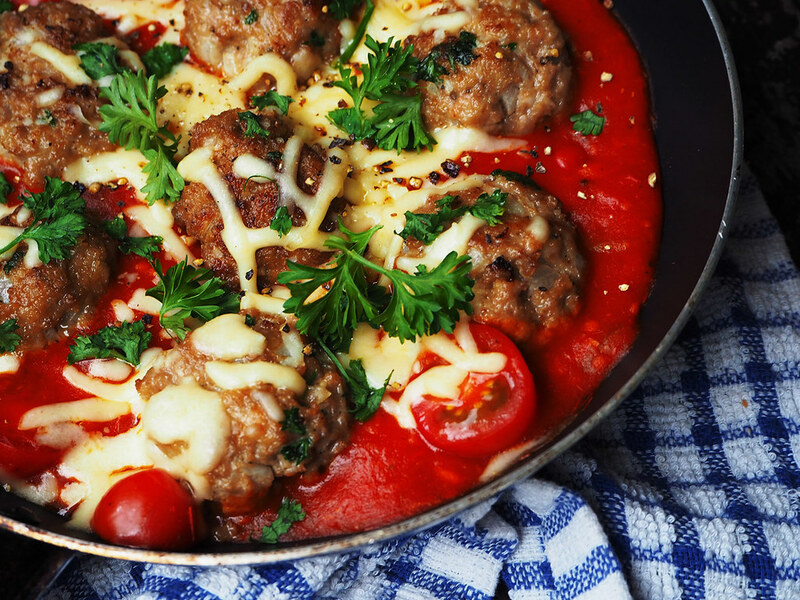 If you thought tomato meatballs were paired best with pasta, you are wrong. You have lived your life in darkness until this very moment. 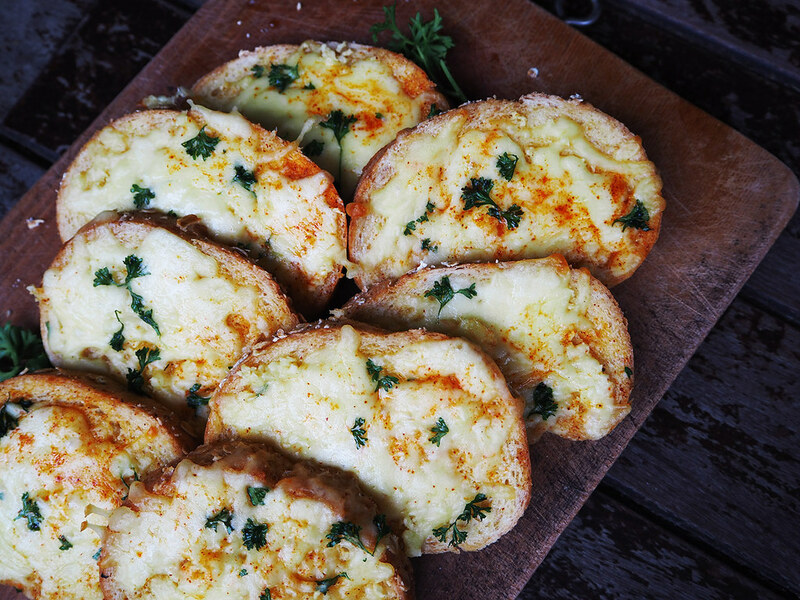 Let me educate you: they are literally AMAZEBALLS with garlic bread! If I could describe it with one word, it would be “hearty”. A party in your mouth to make your dinner party complete. Thank you Perfect Italiano for always inspiring me to come up with new recipes to experiment with, taking my love for cheese to newer heights each and every time! It has been a blossoming and fulfilling relationship ever since I first picked a packet of your cheesy goodness up! 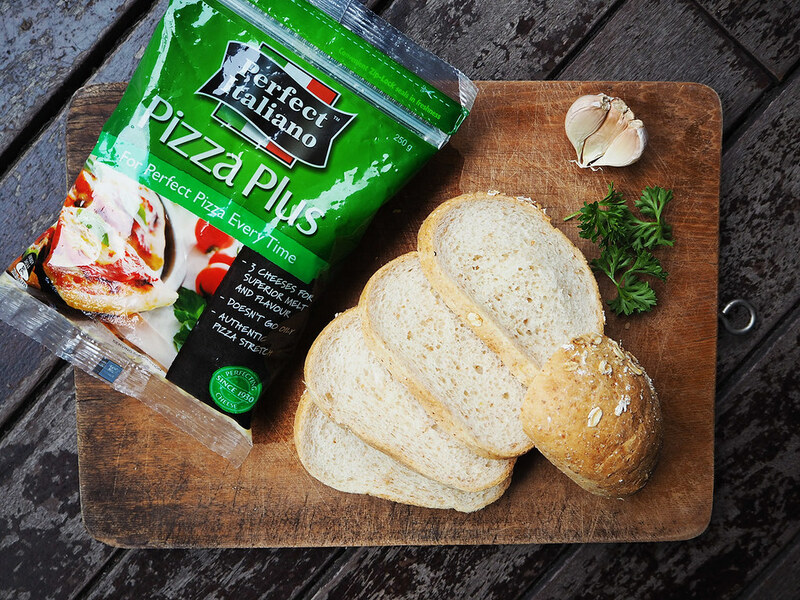 Available at leading supermarkets, visit them at Perfect Italiano’s official website for more piping hot ideas to go bonkers in your kitchen with, and don’t forget to hashtag your own cheesy creations using #PerfectItalianoSG! 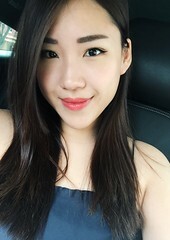 This entry was posted in food / cooking, recipes, sponsored posts by shiberty. Bookmark the permalink. Welcome to my blog, where I document everything from my everyday musings, to life-altering adventures & everything else in-between. Food is my passion. I create, style & customize delicious desserts for special events at my dessert cafe, Shiberty Bakes! Come visit us at 46 Owen Road #01-277 s210046 to try our sweet treats. Even when I'm not working, you'll still find me in the kitchen cooking up a storm. The rest of the time, I'm playing with my adorable bunnies or pondering over life! Writing, fashion and beauty are also significant parts of my life. I love traveling to different parts of the world to explore, taking a ton of pics as I go. I don't think a day goes by without me enthusiastically snapping photos - with every great experience I go through, I think about how I can capture it to share with everyone else.